Our range of products include wooden dining table and dining table. Owing to the vast industry experience of this domain, we are offering a huge collection of high-quality Wooden Dining Table to our valued clients. 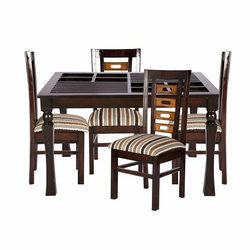 Four Seater Dining Set in Brown Polish by karigar. With the support of our professionals, we are offering the best quality array of Dining Table to our esteemed customers. 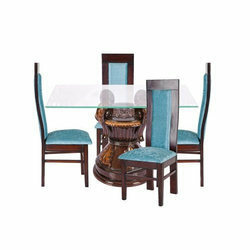 Dining Set Four chair with 1 Dining table and glass top, solid Teak, Dining table and chair with Glass top. Fabric shanil on chair.